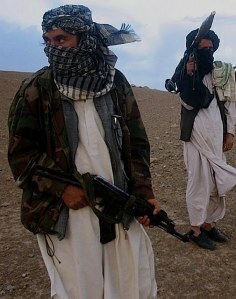 Should the left call for Taliban victory? AS SOCIALISTS, we support the right of oppressed peoples to fight for self-determination unreservedly, just as we oppose imperialism, without caveat. This perspective is generally accepted by the left without question in contexts such as Latin America or Africa, where bitter fights against U.S. and European imperialism have been fought and, in some cases, won. Yet, when it comes to the Middle East and Afghanistan today there is suddenly much less clarity about what radicals and Marxists should be saying. Nowhere is that more evident than in the case of Afghanistan, which has suffered under the yoke of U.S. imperialism since 2001 (with active U.S. interference in the country since at least the 1970s). The idea that the Taliban, as a movement fighting against U.S. occupation, is a force we should be supporting is, unfortunately, a somewhat controversial position to hold, even on the far left. This is a serious mistake and speaks both to the extent to which Islamophobia has penetrated the left, as well as to the lack of understanding of the social dynamics of an oppressed and devastated country like Afghanistan. We are all familiar with the lies and excuses used to justify the invasion and occupation of Afghanistan in the wake of the September 11 attacks. Bush and his coterie of crooks and warmongers told us that only a military invasion could liberate the people, and especially the women, of Afghanistan from the brutal, misogynistic and “medieval” Taliban movement. There was no mention, of course, of the substantial support offered to the Taliban regime in the late 1990s when Clinton was president and in the early days of the Bush presidency, nor of the long and ugly history of U.S. intervention in Central and South Asia, which was an important precondition for the rise of Islamism. We should condemn unreservedly the oppression of women and the general social conservatism of the pre-2001 Taliban regime, as well, of course, as their efforts to cut deals with regional and global superpowers against the interests of the vast majority of Afghans. However, we must also unreservedly condemn the racism and Islamophobia used as an ideological fig leaf to justify invasion and imperialism, and it is the left’s weakness on this issue, which has blinded many to the new realities on the ground in Afghanistan. Before addressing the important question of who the Taliban actually are, it is important to understand the material conditions Afghans face. Afghanistan is a devastated country. It is ranked at or near the bottom of a broad range of social indicators, such as levels of poverty, infant mortality, literacy, per capita income, prevalence of easily preventable diseases and so forth. Most major cities in Afghanistan, including the capital Kabul, are in ruins (despite claims of “reconstruction” by NATO imperialists) and decent roads, electricity, clean water, sanitation and basic social services are unheard of for most of the population, especially in the rural areas. The majority of the population ekes out a living on a subsistence basis, and the struggle for survival is the overarching concern for most Afghans. In a nutshell, there is no Afghan working class or progressive petit bourgeoisie to speak of, and the major social classes (aside from the puppet regime and it’s assortment of bandits and thugs) are the poor peasantry and the Islamic clergy. THE SIGNIFICANCE of this to a discussion of anti-imperialist resistance in Afghanistan should be obvious to any serious historical materialist. This question cannot be thought about in the abstract, it must be considered in light of the material realities on the ground. Such realities necessarily shape the kinds of social forces and the character of class struggle in that country and make it highly likely that any grassroots resistance will have a strongly religious character, given that the rural clergy are the only force capable of uniting the peasantry against the comprador ruling class. The following point cannot be stressed enough; whilst the U.S. remains in Afghanistan, economic and social development will not occur much beyond current levels. This in turn means that the Taliban, as a broad-based movement of poor farmers and lower clergy, is the face of anti-imperialist resistance in Afghanistan for the foreseeable future. To put it another way, if we, as avowed anti-imperialists, intend to wait around for a resistance movement that agrees with us on every issue, including the need to fight the oppression of women, gays, racial and religious minorities, etc., we’ll be waiting a long time. The Taliban is the resistance in Afghanistan and we must support it, critically, but unreservedly. To be sure, there are attacks being carried out by people who support the former regime, but many, perhaps most, resistance fighters have no particular loyalty to the former leadership and some are actively hostile to it. Anand Gopal, one of the few independent journalists actively trying to find out what is actually happening in Afghanistan has written some very useful and insightful work on this, and as he points out, the ranks of the Taliban have been swelled in recent years by rural peasants who have been radicalized as a result of US/NATO brutality, including the indiscriminate air attacks which have killed thousands of Afghans. The Taliban are increasingly espousing a strong nationalist message and, in some cases, have substantially moderated their social conservatism in order to build a more broad-based and effective resistance movement. There is no fundamental difference between the liberation theology movements in South America and the popular Islamist resistance movements in the Middle East and Asia, movements such as Hezbollah, Hamas and the Taliban. To be sure, the former were less socially conservative, but as religiously colored grassroots resistance movements they are essentially the same kind of manifestation of class resistance. The left needs to ask itself why it is much more critical of Muslims expressing class anger in a religious form than of South American Christians; to my mind, unexamined Islamophobia explains much of this discrepancy. Most of us have had fears of one kind or another. Some fears are quite rational. If someone threatens you, and you have reason to believe that person will carry out his threat, your fear is rational. Not all fears are rational. Have you ever been short of breath, shaking, nauseated and light-headed within elevators, closed rooms or crowded places? Experienced a panic attack in a high-rise building? Do you have an irrational fear of germs? Of strangers or foreigners? Of shadows? Of thunder or lightening? Of spiders? Of public speaking? Afraid of flying? If you’ve experienced any of these, you’re suffering from a type of irrational fear called a phobia. These are some of the most common phobias. People suffer from literally hundreds of phobias. A relatively recent irrational phobia that hasn’t even appeared on all the lists is Islamophobia – fear of Islam. In 1996, the Runnymede Trust established the Commission on British Muslims and Islamophobia. The term was defined by the trust as “an outlook or world-view involving an unfounded dread and dislike of Muslims, which results in practices of exclusion and discrimination”. It is seen as separate and “other”. It does not have values in common with other cultures, is not affected by them and does not influence them. It is seen as violent, aggressive, threatening, supportive of terrorism and engaged in a clash of civilizations. Of course, Muslims and others who have lived in Muslim countries know how absurd these perceptions are. Why, after more than a decade, do Westerners still believe these false assumptions about Islam? What are the sources of the baseless fears feeding these perceptions? Israel’s use of words like disputed territory rather than occupied, redeeming for stealing land, terrorists rather than resistance fighters for Palestinians, anti-Semites for critics of Israel (self-hating Jews if the critics are Jewish). American Israel Public Affairs Committee (AIPAC) bulletins and lobbying – AIPAC’s only purpose is to ensure American support for Israel. No matter what Israel does, it cannot do any wrong. American Jewish Committee (AJC) newsletters – despite efforts by Jewish organizations to stifle criticism of Israel and objections to Zionism, anti-Zionism is not anti-Semitism. Not all Jews are Semites. Most Arabs are. ZOA – Zionist Organization of America. Articles by writers like Daniel Pipes, (who claims an Islamist goal is to take over the United States and replace the constitution with the Koran). Anti-Arab, anti-black radio broadcasts by Rush Limbaugh and Arab-hater Ann Coulter. TV influence of Fox News anchors, like Bill O’Reilly, labelling Arabs as anti-Semites and terrorists. Hollywood films have been vilifying Arabs for more than 50 years. Paul J. Balles is a retired American university professor and freelance writer who has lived in the Middle East for many years. For more information, see http://www.pballes.com. London Mayor Boris Johnson says Muslim children with suspected radical parents must be removed from their families, causing controversy amongst the city’s Muslim community. The London mayor made the remarks in his weekly Daily Telegraph column published on Monday. He alleged that some Muslim children were being “taught crazy stuff” similar to the views expressed by the two men who killed British soldier Lee Rigby on a south-east London street in May 2013. In a later interview however, when asked if the children of the UK’s far-right British National Party (BNP) activists should also be removed from their families, Johnson said this should be done in “extreme” cases. The Muslim Council of Britain warned that Johnson’s remarks risked provoking anti-Muslim sentiment across the UK. “The people responsible for the murder of Lee Rigby were not sons of radical extremists, nor were those who committed previous atrocities. To tackle their extremism we need to look beyond the need to generate easy headlines,” the council said. Britain’s largest force, the Metropolitan Police, recorded 500 anti-Muslim crime cases across the country in 2013. Johannesburg – In a desperate attempt to swing Western nations’ public opinion against Iran, Israeli leader Benjamin Netanyahu – widely viewed in Muslim society as a major villain in promoting Islamophobia – has yet again resorted to vile anti-Islam rhetoric. This episode is certainly not isolated from Netanyahu’s past. He has a history of fuelling hatred against Islam and has done so by dividing Muslims into various camps and categories. As a leading Islamophobia ideologue he can claim “success” if it’s the correct term one may use to describe his influence on America’s neoconservative movement and the range of wars spawned by them across the Muslim world. In the machinations of Empire, religious and ethnic differences are often used to justify wars and repression. Historical examples abound. Animosity between nations’ ruling elites are framed in religious terms to rile up the populace and convince them the antagonisms between rulers over land and money are actually between the common people over religion. From there, the antagonism disintegrates into hatred and then war. Despite the conclusion of many religious adherents and teachers that all religions are merely different paths to the same godhead, people continue to cave into the fears propagated by other clerics and institutions that only their religion is the one true one. All others, therefore, are false and their followers are infidels. Once the flames of religious hatred are lit, it becomes very difficult to extinguish them. History has proven this over and over again. Most recently, the world has seen this manipulation of faith take place against Muslims. This is not the first time Islam has been the focus of hate. Various Christian faiths have considered it a demonic religion over the centuries, from the Catholic Church to the small sect run by Terry Jones in Florida in the US. It was Islam, after all, that bore the brunt of the Catholic Crusades in the middle ages. It was also the Catholic Church that ravaged the lands of Spain during the Reconquista; and it was the Catholic Church that forced Jews and Muslims alike to renounce their faith or face death during that same period. Like most prejudices that the ruling classes and their politicians stir up for their own ends, much religious hatred is based on ignorance and misunderstanding. This is certainly the case when it comes to Islam and its perception among many Christian churches. Despite the fact (or perhaps because of it) that Christianity, Judaism and Islam are all derived from the legacy of Abraham, the level of ignorance about this among believers is astounding. Indeed, it would leave one to think that perhaps that ignorance was intentional. In other words, Orientalism is a framework developed by the West to define the non-European part of the world that emphasizes the differences between these two artifices. It often has little to do with the reality of life and thought in the non-European world and is a methodology used to justify the occupation of those lands, the subjugation of their peoples, and the use of whatever means it takes to do so. In addition, it ignores essential facts that do not fit its framework that assumes the superiority of the West. Kumar discusses five myths Orientalism bases itself on and, in doing so, effectively dismantles those myths. While reading this particular chapter it felt like I was reading any number of news articles from the past fifty years explaining how Washington’s enemies were less civilized, less worldly than Americans. Medievalist, sexist, less value placed on human life, incapable of democracy or rational thought; the rationales for opposing Islam are not much different than those given for slaughtering over a million Vietnamese. Kumar looks at these phenomena historically and provides a perspective rarely if ever considered by most Western commentators. Much of Islamophobia and the Politics of Empire is an examination of the relationship between the ruling elites in Washington DC and the various elements of Islam, especially during the last twenty or thirty years. The text takes a look at Washington’s relationships with state and non-state entities. This includes Washington’s self-serving support of the Saud family in Saudi Arabia to the CIA coup in Iran that led to the tyranny of the Shah; from the arming of the Afghan mujahedin against the Soviet army to the endless war on the Afghan people and its expansion into Pakistan via armed drones. Kumar explains the economic, political and military reasons for the skullduggery and death waged in Americans’ name in countries Kumar terms “Muslim majority.” She never lets the reader forget that underlying the entire Islamophobia project is the desire for hegemonic control of the world by Washington. After exploring the reasons for and the results of the Islamophobic project in the Empire’s outposts, Kumar turns her eye inward to the United States. She chronicles the legal attacks on mosques and Islamic social service foundations under the guise of their “support” of terrorism and discusses the growth of anti-Muslim and anti-Arab sentiment stirred up by various right wing and Zionist individuals. Citing the example of the so-called “Ground Zero” mosque, she exposes the politics of the individuals and organizations behind the campaign to prevent the building of that structure. Although many readers identify Islamophobia with Zionists, the neocons and their Christian fundamentalist supporters (Kumar spends a fair amount of tine elucidating on this), the book makes it clear that this phobia is not limited to that particular mindset. In fact, Kumar labels the liberal version of this phobia and the policies it informs “liberal Islamophobia.” This latter incarnation is one that pretends to understand Islam, while simultaneously accepting many of the same myths about the religion maintained by the aforementioned groups. There’s a lot in this book. Deepa Kumar takes a subject that is often intentionally misconstrued and brings a clarity that incorporates the multiple facets involved. Politics and religion are notoriously dangerous bedfellows, yet they have tended to define human history for as long as there has been such a thing. This phenomenon has only become truer as history moves on. While other books may explain the religion of Islam and its relationship to Christianity better, Islamophobia and the Politics of Empire stands alone in its exploration of the relationship between western imperialism and the Muslim-majority world, especially as regards recent history. If recent events in the Middle East and other Muslim majority regions are an indicator, this relationship may be on the verge of a substantial change. This makes reading and understanding Kumar’s text even more essential. Ron Jacobs can be reached at: ronj1955@gmail.com. Morris Sadek, a Coptic Christian who lives in suburban Washington, D.C., whose anti-Islam campaigning led to the revocation of his Egyptian citizenship earlier this year, had an exclusive story for Gamel Girgis, who covers Christian emigrants for al Youm al Sabaa, the Seventh Day, a daily newspaper here. Sadek had a movie clip he wanted Girgis to see; he e-mailed him a link. We recognize the sacred right of the state of Israel and the Israeli people to the land of historic Israel . “The right of Return” of the Jewish people to the land of their foremothers and forefathers is a sacred right. It has no statute of limitation. The return must continue to enrich the Middle East . We recognize Jerusalem as simply a Jewish city, It must never be divided, She is, and shall always be, the united capital of Israel . The future of the Palestinians lies with the Arab states. A Palestinian state in Judea and Samaria constitute an imminent danger to world peace. The Chantilly-based National American Coptic Assembly, Inc., a private company with a staff of two, has an estimated annual revenue of $97,000. Considering the fawning pro-Israel statements of its principal, it’s not too difficult to speculate as to the source of that revenue. President Nicolas Sarkozy said on Monday that influential Qatar-based Muslim cleric Yusuf al-Qaradawi was not welcome in France, adding to concerns that the French leader is fueling Islamophobia. Egyptian-born Qaradawi, 86, has been invited to visit next month by the Union of Islamic Organizations in France (UOIF). “I told the emir of Qatar himself that this gentleman was not welcome in the territory of the French Republic,” Sarkozy told France Info radio. He had been due to attend the UOIF congress at Le Bourget near Paris on April 6 alongside renowned Egyptian preacher Mahmoud al-Masri. “I said that a certain number of people, who have been invited to this congress and who maintain or who would like to take positions that are incompatible with the republican ideal, would not be welcome,” Sarkozy said. Qaradawi, who has close ties with the leadership of Egypt’s Muslim Brotherhood, left the country in the 1960s after being imprisoned by the regime of president Gamal Abdel Nasser. He is accused of having made homophobic statements and was banned from entering Britain in 2008. He has been banned from entering the United States since 1999. Sarkozy has fanned right-wing discourse ahead of French presidential elections this year in an attempt to win conservative voters wary of immigration and France’s large Muslim population. Turkish Prime Minister Recep Tayip Erdogan recently accused the French leader of inciting racism and Islamophobia in a bid to get re-elected.